Foodie travellers can enjoy autumn in Maremma by celebrating earth’s gifts with the locals in fun and delicious festivals. Here are the main fall wine and food events in southern Tuscany. Rustic Aperitivo in Porto Ercole – 21 September 2018 at the Club House Restaurant of Argentario Golf Club. Live music and an aperitif with local wines, cheese and savory pies. Morellino Wine Tasting in Scansano – 22 and 23 September 2018. Grape Festival on Giglio Island – 27, 28 and 29 September 2018. Open wineries and tastings from 8pm in the village of Castello. Bruschetta and Olio Nuovo Festival in Montegiovi – 29 and 30 September 2018. Grape Festival in Scansano – 29 and 30 September 2018. Open wineries to pay homage to the DOCG red wine Morellino di Scansano. Grape Festival in Cinigiano – 4, 5, 6, 7 and 8 October 2018. In addition to wine tastings, there is also a fload parade. Amiantino Mushroom Festival in Bagnolo – 6, 7, 13 and 14 October 2018. 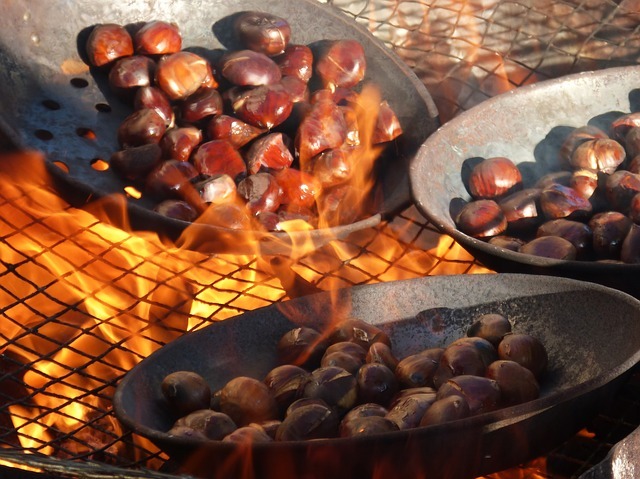 Chestnut Festival in Monticello Amiata – 12, 13 and 14 October 2018. Chestnut Festival in Arcidosso – 19, 20 and 21 October 2018. Wine Festival “Gustatus” in Orbetello – from 31 to 4 November 2018. Tastings, cultural events, street artists and live music is what you will find along the streets of the pretty lagoon town. Event Sources: www.tuttomaremma.com – Dates may be changed. You can get more information or confirm event dates with the local tourist office or your hotel. This entry was posted in events and tagged activities, autumn, events, fall, food, foodie . Bookmark the permalink.